Randy, Richard and Brian Bernstein started Arbormasters Tree and Landscape Company in 1979 as a family business venture while attending classes at Towson State University and Johns Hopkins University. 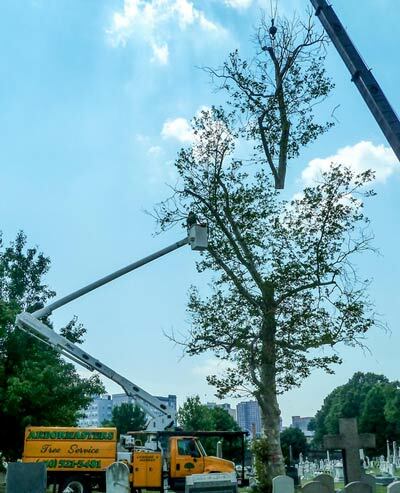 Driven by a love of trees and the environment, the brothers became licensed MD arborists through the assistance of the National Arborists Association (NAA), now known as Tree Care Industry of America (TCIA). Randy’s nuclear family has also contributed to the business over the years with his wife Karen and daughter Maura assisting in the office and son Johnny assisting as a crewmen before joining the Navy. Startup operations began at their first rental property in Woodstock, MD and later moved to a larger property on Lyons Mill Road in Baltimore County, Maryland. Through years of hard work, dedication and love for the business the Bernstein brothers have developed crews who feel more like family members, a fleet of quality machinery and a pioneering work ethic in daily operations. We pride ourselves with a heavy emphasis on quality and rely on our strong reputation across the local communities to drive our business. Our business is licensed by the State of Maryland to practice and advertise tree care services, which means we "must possess adequate and related college education plus one year of experience under a LTE or have three years experience under a Licensed Tree Expert (LTE), then have passed an exam and carry adequate amounts of liability and property damage insurance." Randy's MD Tree Expert license number is 309. Arbormasters, Inc. is also a licensed pesticide applicator (MD Department of Agriculture #1126), a licensed home improvement contractor (MD DLLR Home Improvement Commission License #51326; Randy's Contractor/Salesman License #68554), and we maintain International Society of Arboriculture Certifications (ISA Certified Arborist #MA-3257A). Call us at 410-521-5481 for more information about the services we offer or to request a free quote. Baltimore City & Baltimore County, including Owings Mills, Reisterstown, Randallstown, Pikesville, Towson, Lutherville, Timonium, Woodstock, Catonsville, and Stevenson. Howard County, including Ellicott City, Columbia, Elkridge, and Hanover. Carroll County, including Sykesville, Eldersburg, Marriottsville, and Westminster, MD. Note: This is only a partial list of cities, towns, and communities that we serve. Should your project be anywhere in Baltimore City, Baltimore County, Howard County or Carroll County Maryland, please contact us to see if we might be able to assist you.